Imperial Lion Peak Dragonwell Green Tea tea leaves are harvested from Lion Peak Mountain or rather known as Shi Feng Shan in Chinese which is situated at 1,000 metres above sea level. 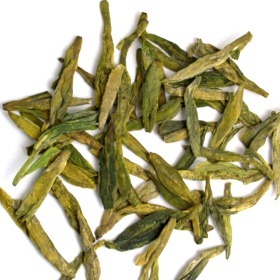 Imperial Lion Peak Dragonwell Green Tea is the best Lion Peak Mountain Long Jing. Imperial Lion Peak Dragonwell Green Tea is only harvest during Spring. If you are a Dragonwell tea drinker, spoil yourself with this pre Qing Ming Imperial Lion Peak Dragonwell Green Tea. Chestnutty flavor and aroma and lingering sweet after taste. Flat and narrow greenish tea leaves. The good-tasting standard Dragonwell tea still improved by a unique and subtle flower marks the Imperial Lion Peak Dragonwell Green Tea. The experience of drinking this tea cannot be compared to the rest of Long Jing tea. really excellent long jing, strong nutty aroma. the taste is less nutty that other drangowells but its sweeter. A very good dragonwell with a notable baked/nutty character, and a great Chinese green tea in general. I tend to prefer the more subtle and floral longjings, but this is one that I find myself coming back to often. Good, strong flavor. For my tastes, its not an "everyday" tea, but it is one Ill always keep on hand.